Sussex Cricket are delighted to announce that left-arm paceman Tymal Mills has signed a new one-year deal at The 1st Central County Ground, Hove. 24 year-old Mills, who signed a two-year contract with Sussex ahead of the 2015 season, has put to pen to paper on a new deal which will see him remain at Hove until at least the end of next season. 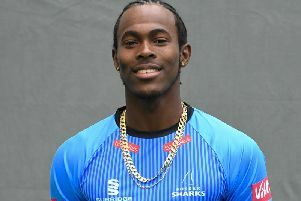 Mills, one of the most explosive fast bowlers in the country and able to clock speeds in excess of 90mph, is restricted to playing T20 cricket due to a back condition, but has excelled in the shorter format for the Sharks. His form resulted in him making his England T20 debut against Sri Lanka at the Ageas Bowl in July. In 24 NatWest T20 Blast matches for the Sharks, Mills has taken 34 wickets at an average of 19.23, with his career-best T20 figures of 4 for 22 coming in the victory over Middlesex at Lord’s in 2015. Mills will concentrate on T20 cricket for the foreseeable future and is setting his sights on some of the global tournaments this winter and beyond. Mills said of his new deal, “The club have put a lot of time and effort into me, so I’m looking forward to repaying them by doing well in T20 next year. Hopefully we can build something special moving forward. “Obviously, when I first signed, I was hoping to play in all three formats but that hasn’t worked out, so I’m only playing T20 now and focusing on that. Sussex’s Head Coach Mark Davis said, “I am delighted that Tymal has signed a new contract with Sussex for 2017. He had a very successful T20 campaign for us this year and is a bowler of immense ability. Sussex skipper Luke Wright added, “I’m delighted Millsy has signed a new contract. He is a big part of our T20 side. It is fantastic as captain to have such pace to turn to; he has a great ability to get the top players out. From a crowd point of view, it is exciting to watch such a fast bowler flying in down the hill at Hove.